When I had my recent session making a whole bunch of new tongs, my forge seemed a bit ‘off‘. Like it was having a bad day. At first, I couldn’t figure out why. But then I walked away from it to go get something … as I was walking back, I could see an odd glow coming from underneath. 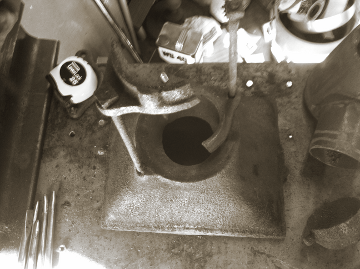 Turns out, a part of the firepot assembly had broken, and the whole thing was hanging down causing a 1″ gap to open up. No wonder I wasn’t getting much of an air blast! In this particular forge, the firepot assembly has the firepot itself, which hangs from a flange, then the clinker breaker, held in place with a type of collar, the collar is held in place by the tuyere, which is in turn held in place by another collar / bracket to which the ash dump attaches. The whole lot is tensioned up by two threaded rods that run from the bottom of the firepot down to the bracket for the ash dump… which happened to break into two pieces on me. It’s not that this will be all that difficult to fix (although, it would be easier with a working forge) – it’s just getting frustrating. It seem that every time I get into doing some serious work, my equipment is breaking on me. I think I’ve had enough of these ‘antiques’. Sure, they look neat, but after sixty, ninety or more years of working, they’ve had their day. I think I’m going to seriously consider getting these two antique forges into working condition, and then sell them to make way for new / modern replacements. This entry was posted on Saturday, June 16th, 2012 at 11:27 am	and is filed under The Journey. You can follow any responses to this entry through the RSS 2.0 feed. You can leave a response, or trackback from your own site.